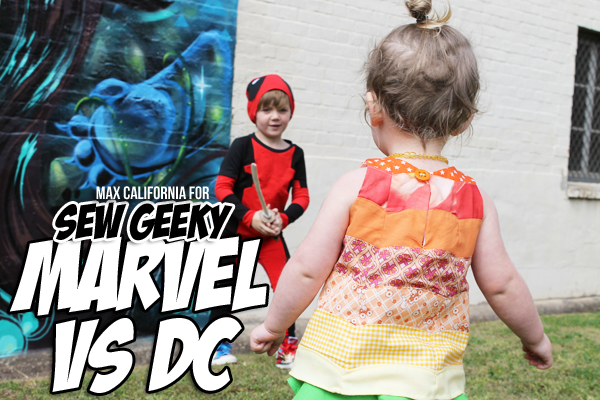 Max California: Sew Geeky Episode V: Deadpool vs Aquaman! 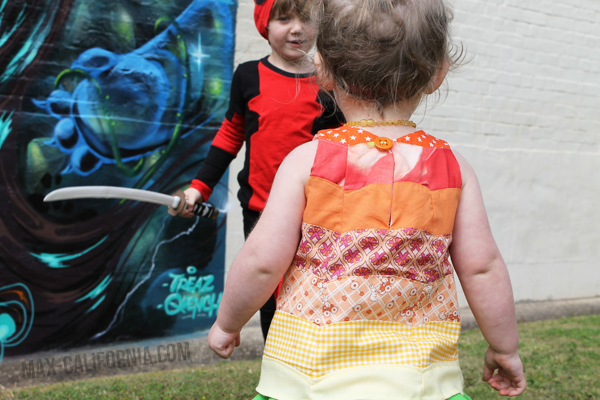 So excited to bring you guys this month's offering of Sew Geeky! We now have a blog especially for SG, view as a hub of sorts! You'll be able to go there to see all our past Sew Geeky episodes in one place, as well as linky parties, giveaways and our pinterest boards! If you have ever sewn anything geeky please send us the pin to our Pinterest account, or email us or hashtag us on Instagram (#sewgeeky) or share it with us on our facebook page! The five themes we have done so far all have linky parties on our Sew Geeky hub blog and we would love for you to link up your projects! 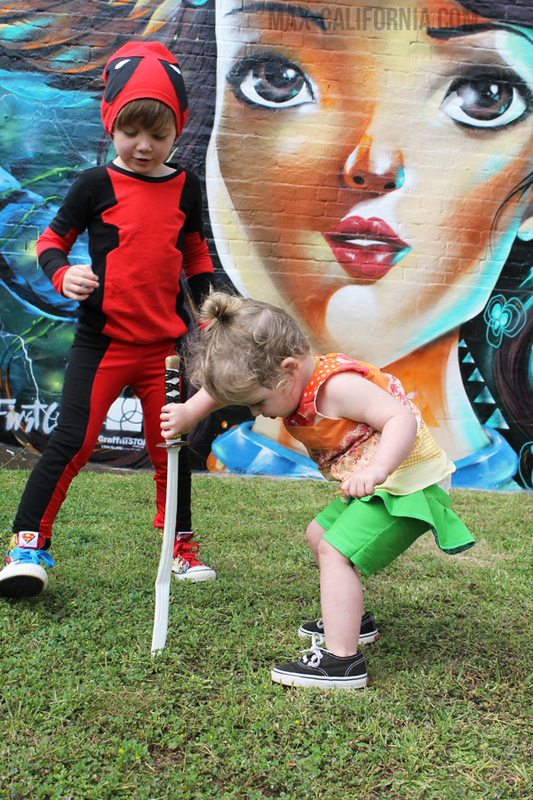 So far we have done: 8-bit babies (arcade games), Star Wars, Tank Girl, Classic Anime and Marvel Vs DC! You can also check out our next 5 months of themes here. 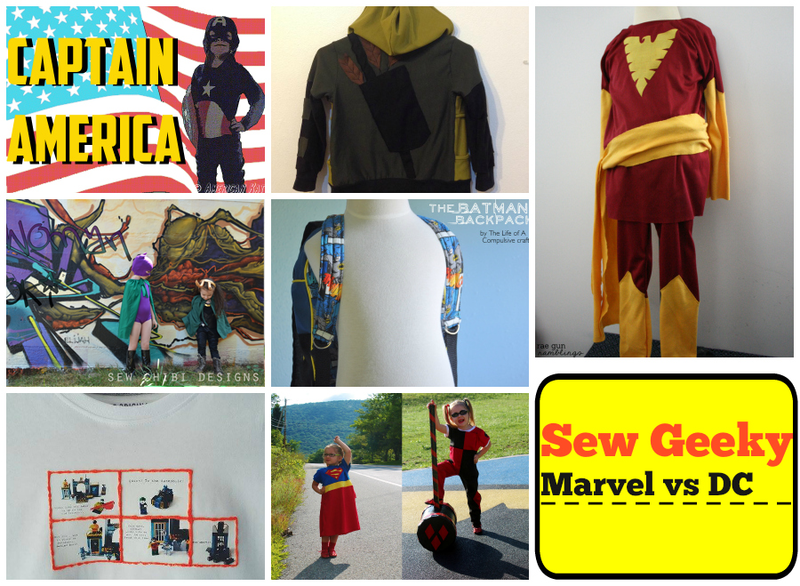 So if you haven't already, bookmark Sew Geeky to your favourite blogroll (we use Bloglovin'!) so you don't miss a thing! Okay! 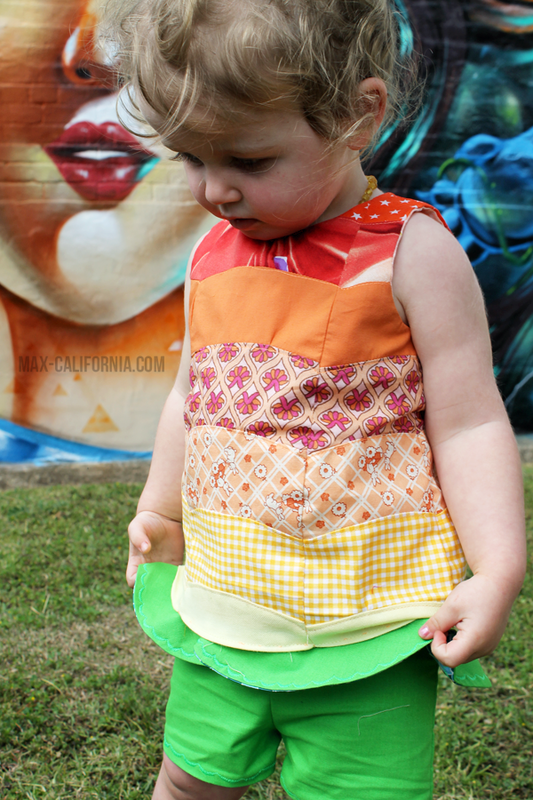 Now all that is out of the way I'm stoked to show you what I sewed up for this month's theme! Marvel Vs DC, now it wasn't that difficult really. 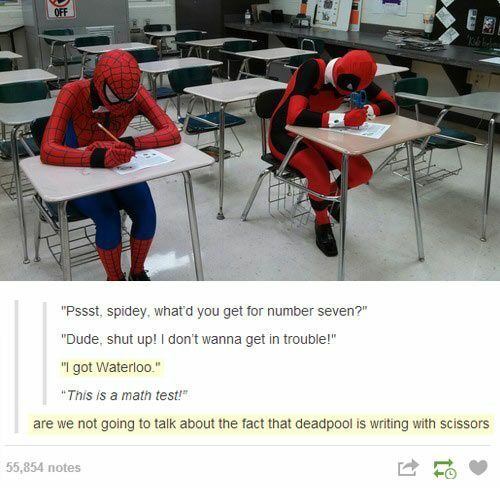 I mean I don't exactly LOVE Marvel, but I do have an appreciation of the Xmen, and also Deadpool. I know a lot of people think that Marvel is superior, but I don't really care if people tease me for liking DC because (a) I'm used to being teased for being a nerd and (b) I don't ever conform. I like what I like! For this month's Sew Geeky I gave myself the additional challenge of using only FREE PATTERNS that you can easily download and follow online! How neat is that? (pretty neat!) I'll be detailing which ones I used! 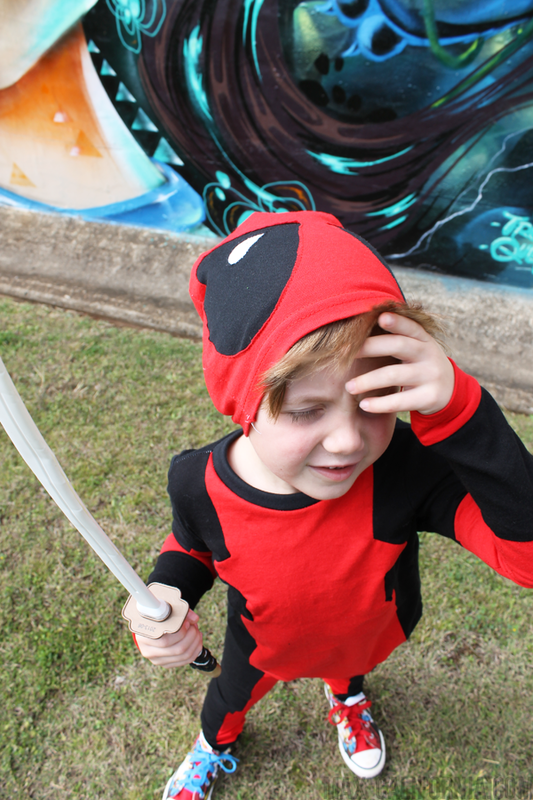 Vincent had the choice, I was going to make Deadpool and Aquaman and he could decide which one he wanted to be. I was mildly surprised that he chose Deady! 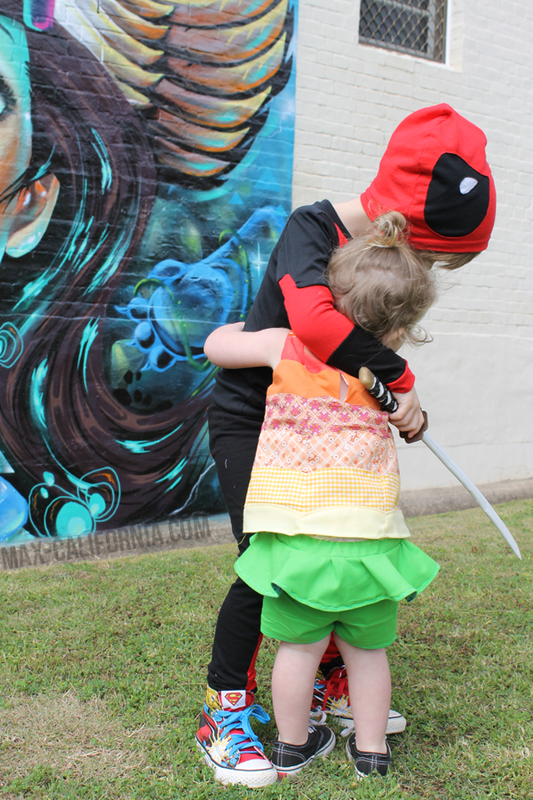 Real quick, here's my little disclaimer: Deadpool is TOTALLY not a rolemodel for kids. 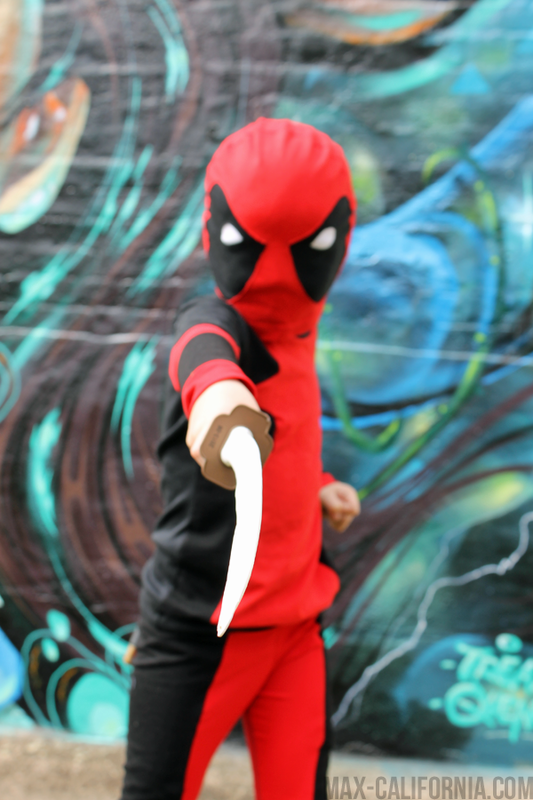 In fact a lot of superheroes and stuff are pretty violent even if they are fighting 'bad guys' and I really don't condone that kind of aggression in my little guy at all; but Vincent is just dressing up as Deady, he's never read a Deadpool comic or seen any footage of the guy (or heard him talk lol), he's just seen a few comic panels online that I was using as reference pics and he has a Deadpool lego minifig. 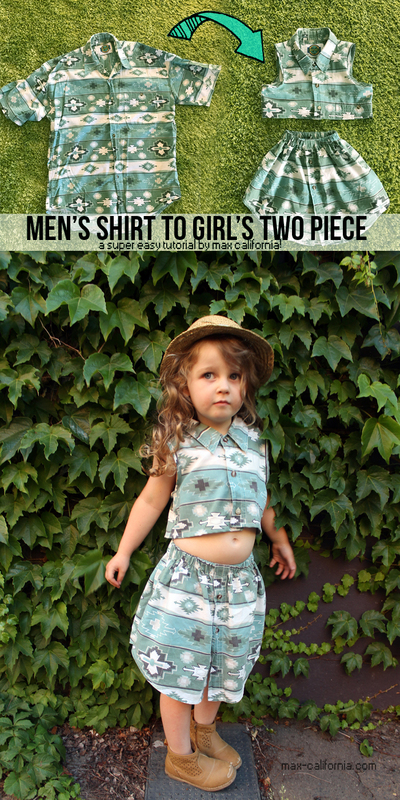 Vince's outfit is made -almost- entirely of recycled t-shirts! 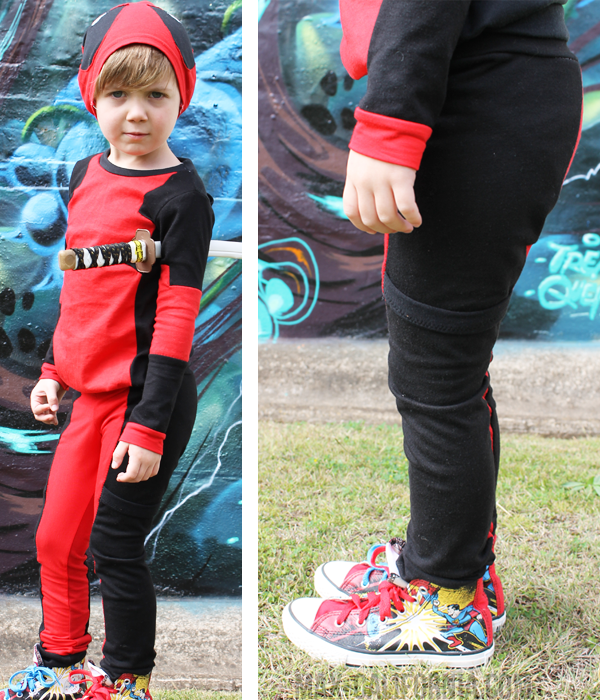 His leggings are from my own pattern, I traced around a pair of leggings that used to fit him and added a few adjustments so that they would fit him. I pieced the legs, so that the outside panels would be black and the inner legs would be red. On the outside of his left leg I added a small band of black stretchknit, it's a holster for him to slip his (NERF) gun into! His shirt was also pieced, which seemed like a good idea at the time but all that pivoting and right angles man, phew! It took a bit of concentration, a bit of chocolate mud cake, but in the end I managed to get those angles of the front and the sleeves done pretty alright! I did use the Flashback Skinny Tee pattern, since I already had it printed out and it didn't really seem right to be printing out another long-sleeved shirt pattern, but if you don't have it yet (highly do recommend it for a lovely fitting tee!) 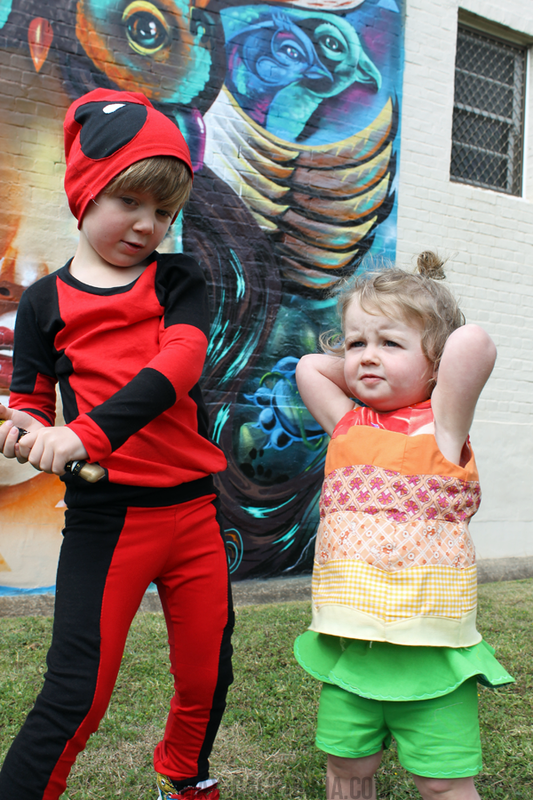 you can get a free long-sleeved shirt pattern over here at Small Dreamfactory in sizes 18months - 4Y. The beanie was a happy mistake! 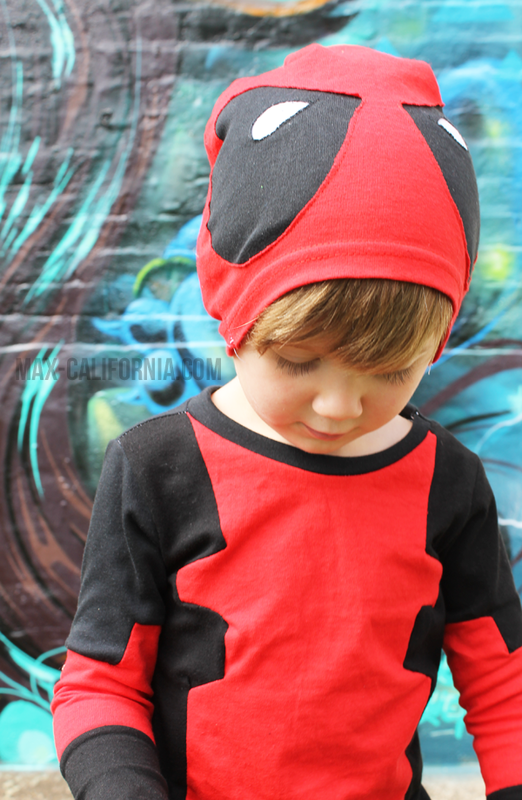 I used my Toddler Slouch Beanie pattern and used the hem of a red shirt so that the bottom of the beanie didn't need a hem at all. 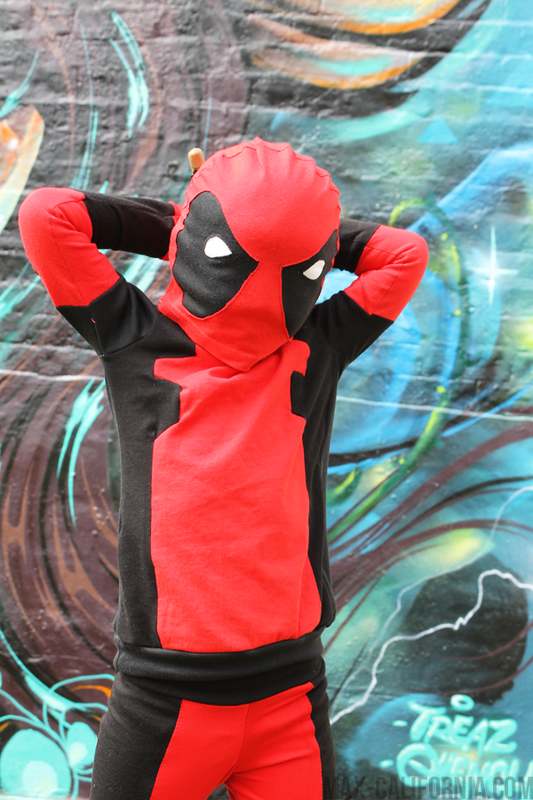 I reverse appliqued Deady's eyes of the mask onto the front section of the beanie then sewed it up. When I tried it on I realised it was big enough that I could pull it down over my face like a mask. Vincent was SO STOKED that it pulled down over his face too. 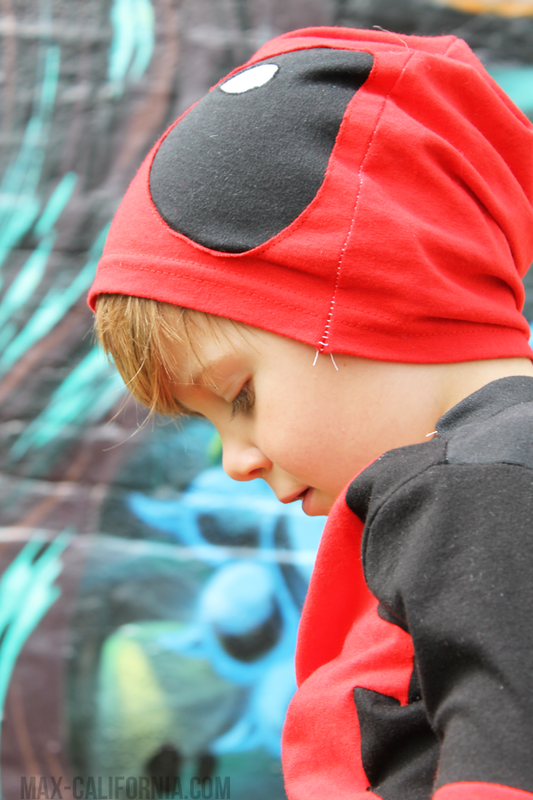 I love that this is a really versatile little item, it can be his mask for when he plays, or just a cool geeky beanie when we're on missions to the shops. His outfit was extremely easy, just a little fiddly to make, and all the pieces are super easy to mix and match with items already in his wardrobe: I mean, that's if he ever takes this off! Eddie's outfit is a lot more subtle, a lot less -obvious superhero- but I really love the understated-ness of it. You know how sometimes you want to make something that isn't obviously a costume? 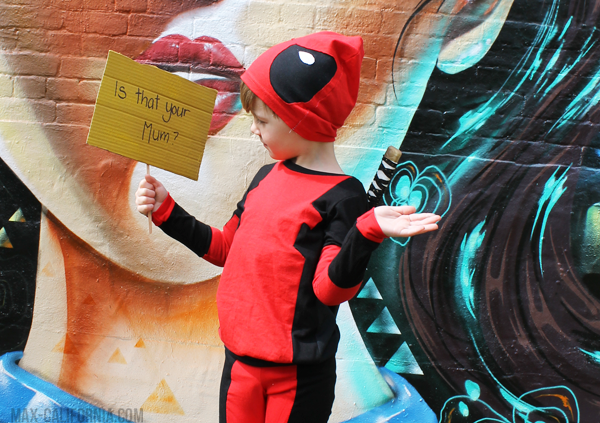 I know some people refer to it as like, being able to wear it out to the shops or to the playground, but I guess those people severely underestimate their kids and their love of dressing up! Vincent would his outfits 24/7 if he could! 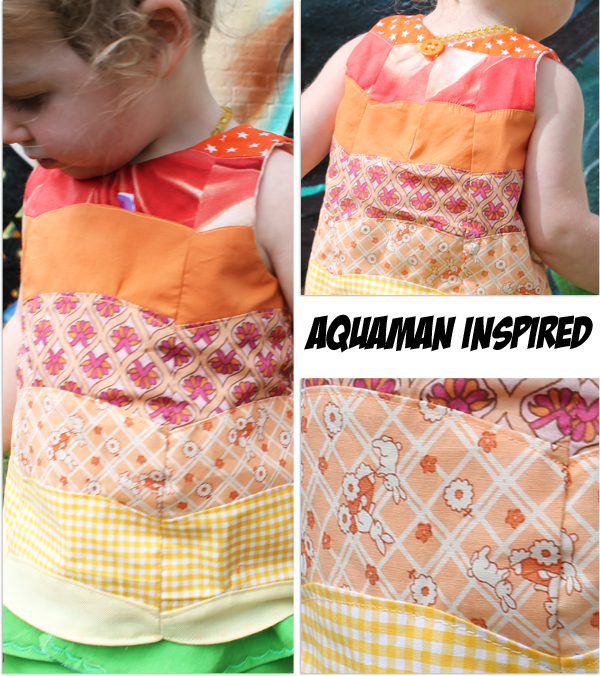 Anyway I loved making this Aquaman-inspired outfit for Eddie! 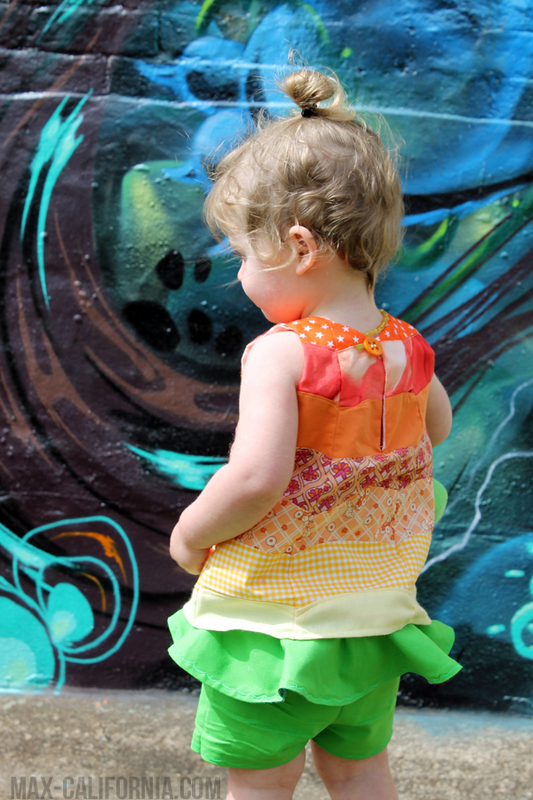 For the top I was inspired by the Wellen Tank tutorial written by Shannon of Luv in the Mommyhood. I've always been enamoured by the top, and so when I thought of a DIY scale effect that wasn't going to be too obviously fishy I immediately thought of this tutorial!It gives you a template for the curves, but for the actual top I used the Confetti Dress which is a free pattern in size 2T by Teri of Climbing the Willow. I altered it just slightly, instead of making it a-line I just folded the pattern down from the armpit straight to the hem then cut out the fabric I had made with the Wellen Cruves from that. This was a simple little tunic top to sew up, just time consuming and all those curves was very repetitive! I started with orange at the topto be like Aquaman's gold scales on the top of his outfit, then sort of ombre-d the colours to some yellows that are symbolic of his golden belt. I fully lined it with some scrap material, and I just love how neat it all turned out. it has a slit in the back and closes with a button and a loop of elastic which isjust so easy and simple and I just LOVE this pattern! I'd actually like to sew this up again, but with the additional longer skirt that you're supposed to add to it. 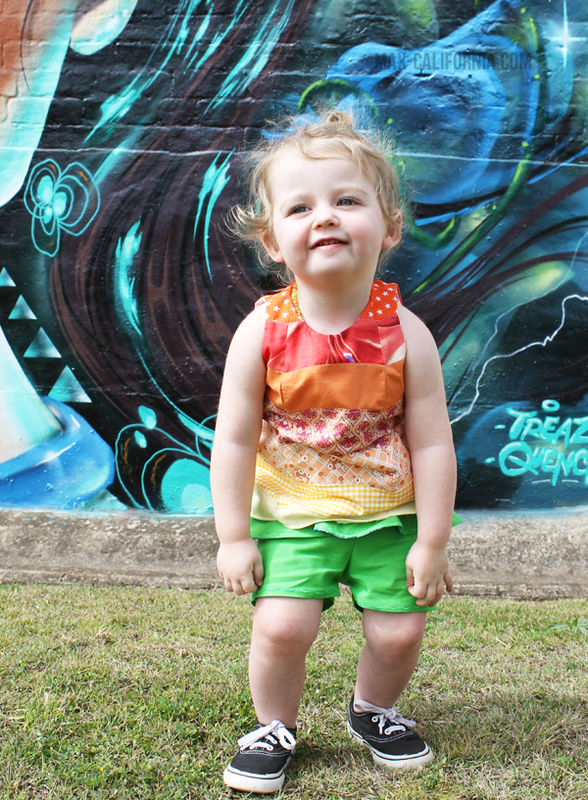 Eddie's little peplum shorts were mad using the Peplum Shorts pattern by Crafting Zuzzy! 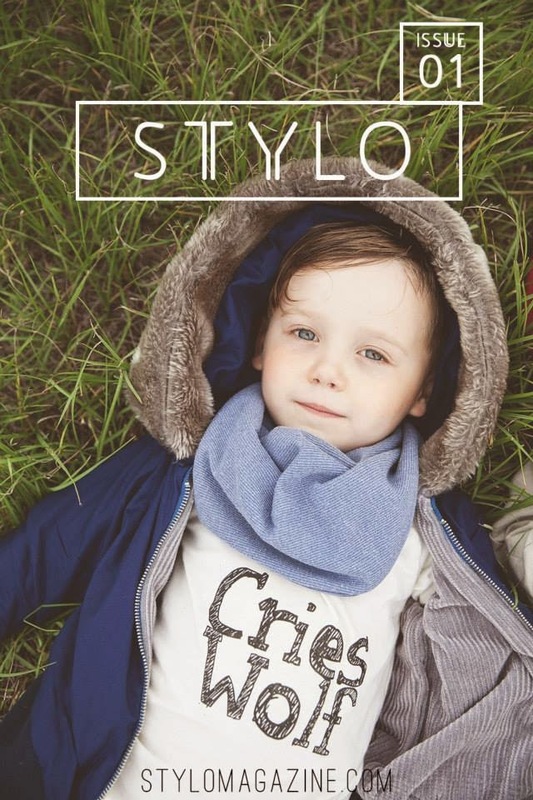 Also a free pattern in sizes 12-18months which is conveniently Edison's size. They were very easy to sew, although I did make a small alteration when cutting out and just added like an inch at the back of the shorts and sloped it down toward the sideseam. Straight across shorts patterns always make me anxious there won't be room in the finished garment for baby booty! I also added a lining to the peplum; which basically involved cutting an extra peplum piece, stitching them right-sides together and then flipping it and ironing it all the right way out. I did a decorative topstitch which is a pretty scallop that I thought was a bit scale-looking. 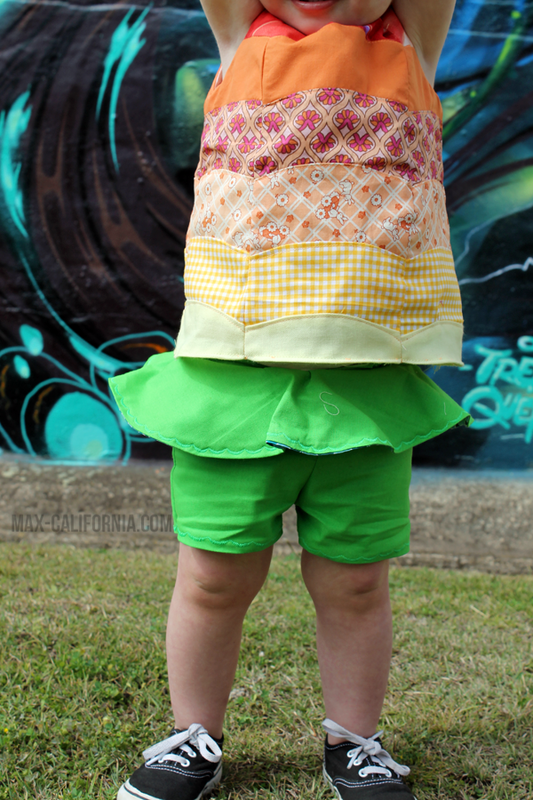 I used the same stitch to hem the shorts! And also I epicly did not get a shot of the peplum lining fabric but you might see little peeks of the fabric that I used in this Mermaid Glass Onion Top. 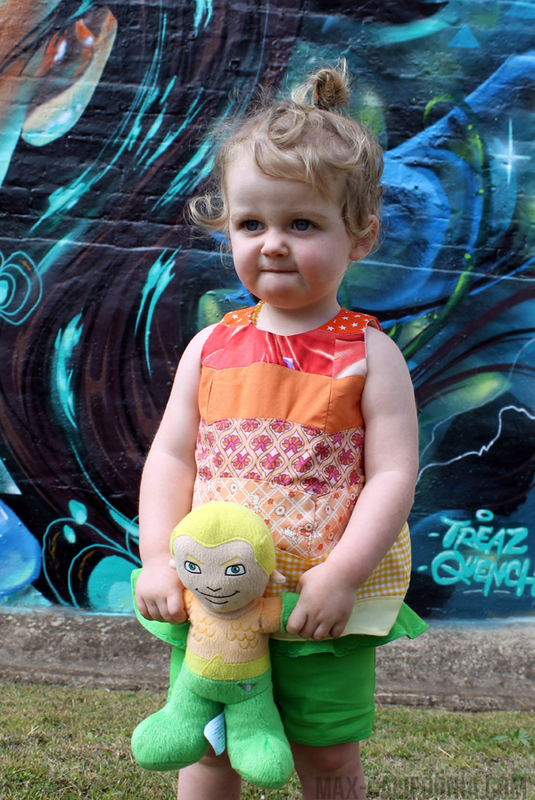 Totally wouldn't be a Sew Geeky post without the Derp right? Less of a derp and more of an aww! 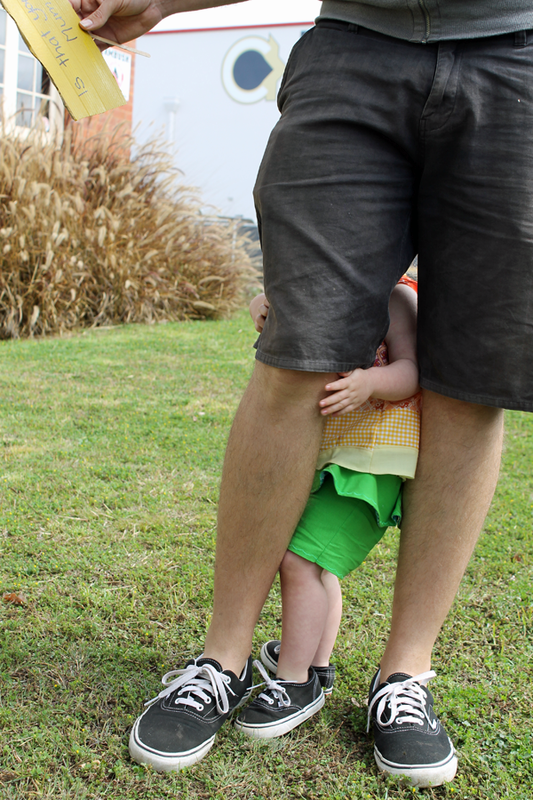 She just wanted to hang out with her Dad instead of take photos. And awww matching vans! 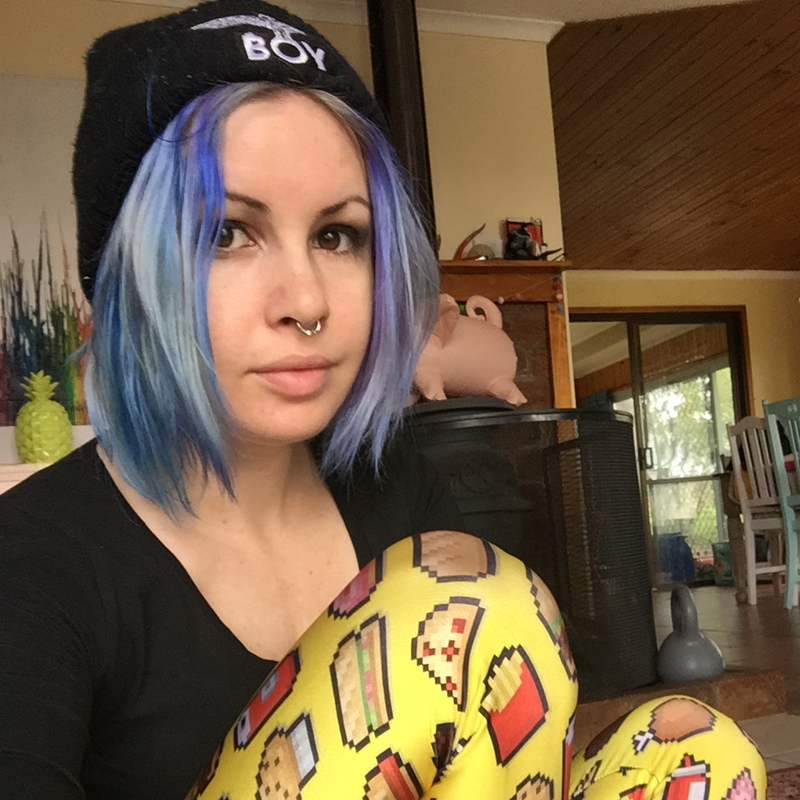 Now go back to the main Sew Geeky blog and check out all the guests we have joining in this month! Seriously Geeking out at all the awesome! 1. American Kat’s Ironman and CaptainAmerica 2. 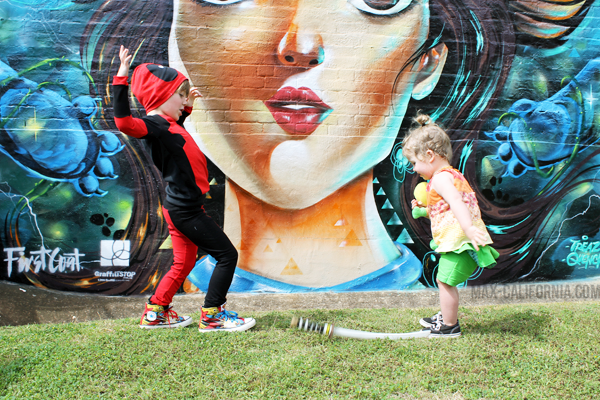 Casa Crafty’s Green Arrow andSpiderman 3. Rae Gun Ramblings’ Dark Phoenix 4. 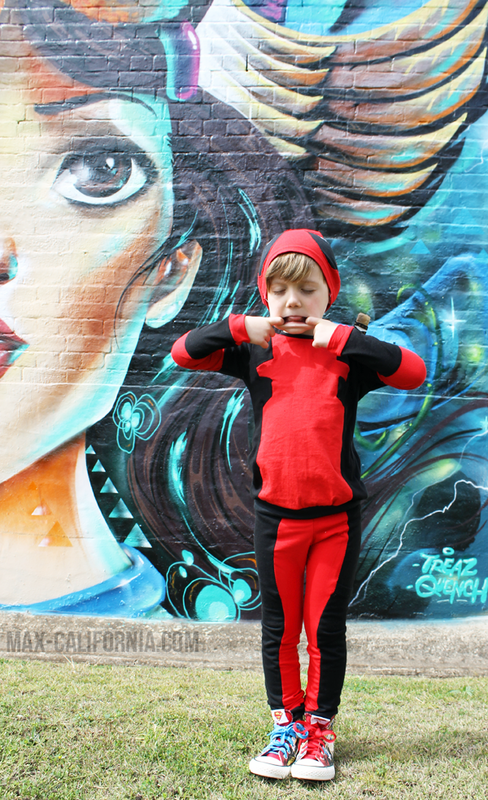 We've discussed my love of Deadpool, so obviously the look is a winner in my book. But, that Aquaman outift....serious stars in my eyes. 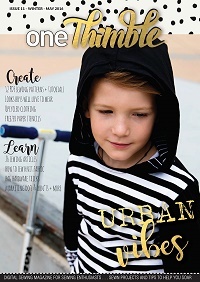 I'm totally digging the slouchy beanie- totally adding it to my to sew list! 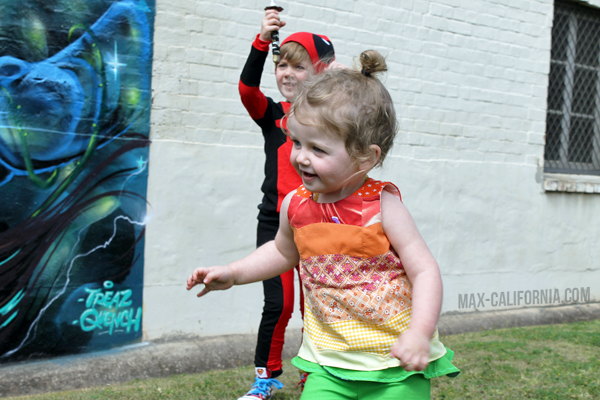 Your kids are seriously so cool AND so so cute! I love their enthusiasm! I can tell they looove their new outfits!